I am so excited to introduce you to an awesome new sponsor, The Pregnant Vegetarian. Contrary to what you may think, The Pregnant Vegetarian, aka Brannan, isn't actually pregnant anymore (you can't stay pregnant forever, ya know), but she still has tons of great information for eating healthy during pregnancy and beyond. Neither is she currently eating a vegetarian menu (you can read about that here), but she has tons of vegetarian and vegan recipes. And lest you think that preferring a vegetarian diet makes her some kind of super health nut, she readily admits that her weaknesses are potato chips and root beer. That's my kind of gal! Brannan posts inspiring weekly meal plans for her family of five, and her most recent ones are ordered around her multitude of food sensitivities. All of her meals these days are gluten free, corn free, dairy free, sugar free, citrus free, legume free, preservative free and dye free (although the older ones still have everything in them). Yeah, wow! That makes my gluten and dairy free menu seem like child's play! So, needless to say, she has a lot of recipes that are not only great for those of us with food allergies and/or sensitivities, they just look downright great. There is a delicious looking recipe for what she calls No Knead Griddle Biscuits (pictured above), two different Guacamole recipes-- one for when you don't have much time and the other for when you really don't have much time-- and a great introduction to Green Smoothies, just to name a few. I even love her recent attempt at making sweet potato chips, because not only are sweet potatoes one of my favorite foods ever, but we can't get them in Moldova, so I pretty much swoon anytime they are mentioned. She also blogs about living life with her two precious boys, ages 4 and 2, and her sweet baby girl. (All born at home, by the way, because I know some of you love that kind of stuff. You can read her most recent home birth story here.) I love that she taught them how to make sauerkraut, and even made cleaning the couch into a game (what a GREAT idea). Her writing is honest, clever, and real, and I really enjoy keeping up with her blog. Yes, this little cutie is making sauerkraut in an old Aerosmith t-shirt turned funky apron! 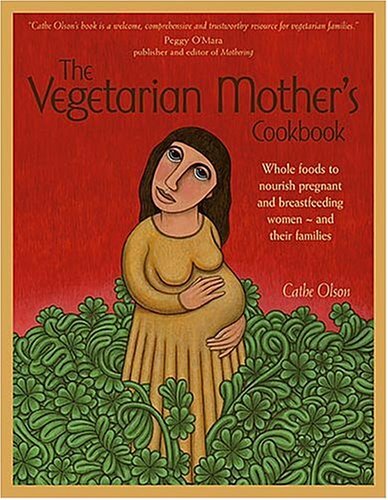 Early on in Brannan's most recent pregnancy, she started cooking through Cathe Olson's The Vegetarian Mother's Cookbook and blogging about it. She has loved this cookbook so much, that she wants to give a copy to one lucky My Messy Manger reader! This giveaway is open to anyone, regardless of where you live in the world. Go to The Pregnant Vegetarian, browse around, and come back and tell me one post that you found particularly entertaining/helpful/whatever. Leave her some comment love while you're there, too. Follow @PreggieVeggie on Twitter, and leave me a comment saying you did so. Like The Pregnant Vegetarian on Facebook, leave her a comment thanking her for the giveaway, and then leave me another comment here saying you did so. Share about this giveaway on Facebook (be sure to include a link to this post) and leave me a separate comment saying you did so. Tweet about this giveaway (again, be sure to include a link to this post, the twitter button at the bottom will give you a nice, short url) and leave me another comment with a link to your twitter. So there are FIVE ways you can enter to win! Comments will close at 12 noon Central Time on Thursday, June 2nd. The winner will be randomly chosen and announced on this blog immediately. The winner will have one week to get in touch with me or an alternate winner will be chosen. Just for the record- The Pregnant Vegetarian is a paying advertiser on My Messy Manger. But I do truly love her blog or I wouldn't be sharing it with you. I like her post "Pregnancy- Vegan Snack p.298: Banana-Molasses Muffins." They sound fabulous! I loved her lentil fried steak creation and would loooove to win that cookbook! :o) - If I win the drawing I'm on FB! i don't have a blog. I like The Pregnant Vegetarian on FB (Suzanne Kristy) and thanked her for the post! I'm following preggieveggie on twitter! I posted it to Facebook!